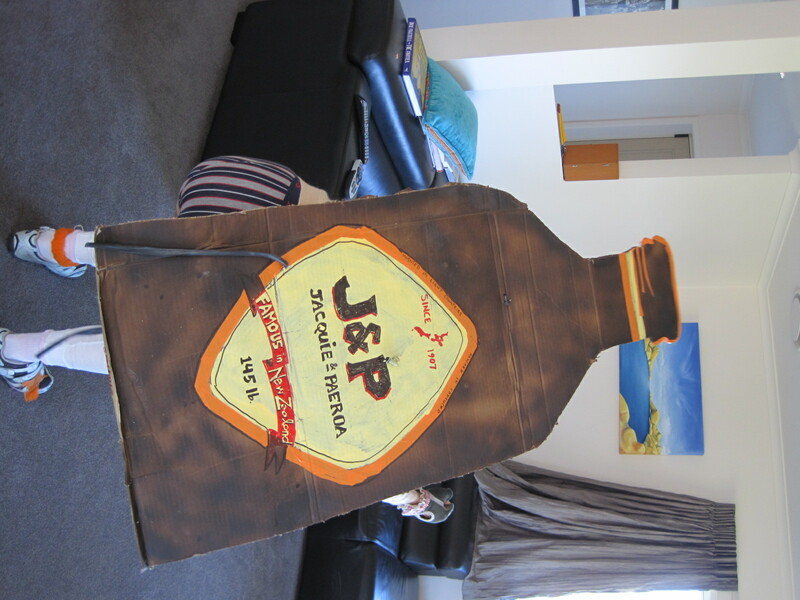 My costume has been developing nicely, and I know that a few hundred others have gleaned debris, or even just bought something at A J’s Warehouse or the Salvation Army…I’m sporting the iconic Kiwi soft drink, the L&P bottle , but with my initials. A bit wide for the twisty single tracks. That will oblige each overtaking rider to plead with me to pass. The less-visible front half of me is the Topp Twins with a twist: a baling twine-emblazoned “Jools & Lynda”on the front of my beige jumper (sweater to you) and two heart-shaped holes clipped in the pertinent places to give The Girls some air. The left is the better side, because of my now vinyl record-sized black and blue bruise from the Whaka race last Saturday. It is marked with the words “actual size”, and the other leg says “actual thighs”. The hematoma resembles cheap Halloween makeup. Luckily it duzzn’t hurt (unless touched). Damo Auton is majestic: he melds artistic prowess, playfulness and damn it, even durability: a real mirror-tiled disco ball topping a silver lame skinsuit and space shoes, plus his usual music speakers. Glitter girl Mops Newell, one of NZ’s top pro women, sported her own silver disco unitard…a perfect (accidental) match. I wish I’d had more stamina to hang with all the incredible riders. Each night I’d turn in at around eleven, just when things would start cooking at that Copper Donkey place. One night I even hitchhiked home, since I’d allowed myself to be driven into town…Obsessive note-and name-taking enabled me read all their blogs, once I got home to my Boring Life…heh. There were about 900 racers… Damon Stewart, my “ten days worth of gracious-living” sponsor wore orange and yellow wings with real feathers, stitched by his sweetie Lucy Manning. Mike the veterinarian wore just his tightie (by now rather Loosey) whities from Napa 08. There were vikings, three of them in yellow fur and horns (crestfallen when mistaken for yellow cows). There were nurses, swamp things, YMCA cops and DeJay Burtch had only a thong, handcuffs and a tambourine (plus that fu-manchu moustache). On one glute: “happy”, and on the other: “pain”. LOTS of business suits this year (I kicked off “here come the suits” trend at Napa), including the vest-and tied pair Ben Bostrom and Chris Clark. Ben took third (though only we are counting). I think he had the two leaders in sight a lot of the time, and like them, took all the beer shortcuts. The Pacific rim team of 5 Filipinos (Agu,Jerry, Patrick, Chaz andAllan) plus Rezak from Singapore wore versions of the nuptial finery–and Jerry told me that his dad had been trained by colonel Bruce Cunningham during the Korean conflict of the late fifties. Come to think of it, I didn’t see Jer afterward with the others…hope he had an OK ride. There seemed to be no real casualties, just a few bloody limbs. But the race, race… sunny non-windy day. The day before was sunny and windy, which dried the course out to perfection, traction-wise. We were gathered in a huge ring and made to ride in a very dense Critical Mass, herded by Dean Watson from high up on a crane. For the second year in a row, I started next to the world-traveling Tarik Saleh, who brought the whole family with him (not into the start corral, though). His pics are some of the best. The corraled racers had to be fully in motion (at .0o2 mph) before we were allowed to funnel through the gate and up a steep Take-A-Number-Please Walk Up A Very Good Hill For Sorting Everyone Out. I was on a borrowed (thank you Kristina!) 9er singlespeed which was perfectly geared, allowing me to pass nearly all the overgeared guys in my “cohort” . I clung to a woman named Rachel’s wheel–a loud muffler rattling away (there was a team of ‘muffler bikes’ ). Her fetching black butyl fringed kilt waving, and all the perfect lines nailed for me. It’s nice to be able to see precisely how the trail doubles back, and I can plan my lean (allowing a bit of clearance for the cardboard bottle). I whacked plenty of trees, but the thing stood up…After a lap, I considered stopping, but there was still some zip in my legs. I went the next lap, and was reet gladduvit. God I sound boring. Almost as bad as the guy explaining to his pal about all the electrolyte replacement he’d carefully put in his bottles. My bike had a tiny waterbottle cage, so I just stopped and grabbed any bottle that looked like it had something in it (including something that tasted nearly chemical–maybe it was the Belgian brew that guy was talking about!) and even bludged a just-bitten-into banana off of a spectator…this made it a breeze to finish, prancing through the giant watercrossing with the invisible bike-eating hole under the surface (look up SSWC2010 images) so as not to pollute the creek (and dry up Kristina’s chain). The afterparty in the park was grand, exhausted riders picnicking while the ‘decider’for 2011 took place–a horizontal bungee competition where you ran as far as you could, and placed a full beer can on the grass. Furthest distance wins. At the end, Ireland took it, and we will all convene on THAT island next year August 27, in Ballyhoorah. Erin go bragh! ~ by jacquiephelan on October 23, 2010.